Herbs, annual; taproot tapered, soft or ± woody. 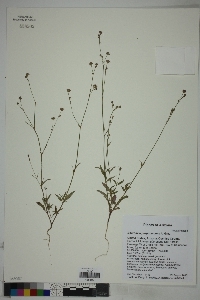 Stems erect or ascending, unbranched when small to branched ca. 1-5 times throughout, 10-60 dm, minutely puberulent to glandular-pubescent basally, usually glandular-pubescent, sometimes minutely puberulent or glabrous distally. Leaves mostly in basal 1/2; larger leaves with petiole 2-22 mm, blade oval, ovate, oblong, or lanceolate, 12-37 × 5-20 mm (distal leaves smaller, proportionately narrower), adaxial surface glabrate, sparsely puberulent, sometimes glandular-pubescent, abaxial surface not noticeably to prominently paler than adaxial, glabrate or occasionally glandular-pubescent, both surfaces usually punctate with dark cells, base round to obtuse, margins sinuate to sinuate-crisped, apex acute, obtuse, or round. Inflorescences terminal, branched ca. 1-4 times unequally, without sticky internodal bands; branches strongly ascending, terminating in compact, capitate or subcapitate flower clusters, axis 0-2.5 mm. Flowers: pedicel 0.8-2.5 mm; bracts at base of perianth persistent, 1-3, ovate to obovate, 2.5-4 mm, apex apiculate; perianth whitish to pale pink, funnelform beyond constriction, 2.5-4 mm; stamens 3-4(-5), well exserted. Fruits 3-9 per cluster, straw colored to grayish tan, broadly obovoid, 2.3-3 × 1.3-1.7 mm (l/w: 1.6-2.1), apex round or broadly obtuse, glabrous; ribs 5, acute, smooth; sulci 2-2.5 times as wide as base of ribs, not or shallowly rugose, lightly papillate. Flowering late summer. Sandy soils in open arid grasslands, among open shrubs or oaks, pinyon pines, juniper [thornscrub]; [200-]1300-1800 m; Ariz., N.Mex. ; Mexico (Chihuahua, Sonora). The inclusion of Boerhavia purpurascens in recent Texas floras is based upon misidentified Mirabilis species (C. F. Reed 1969).